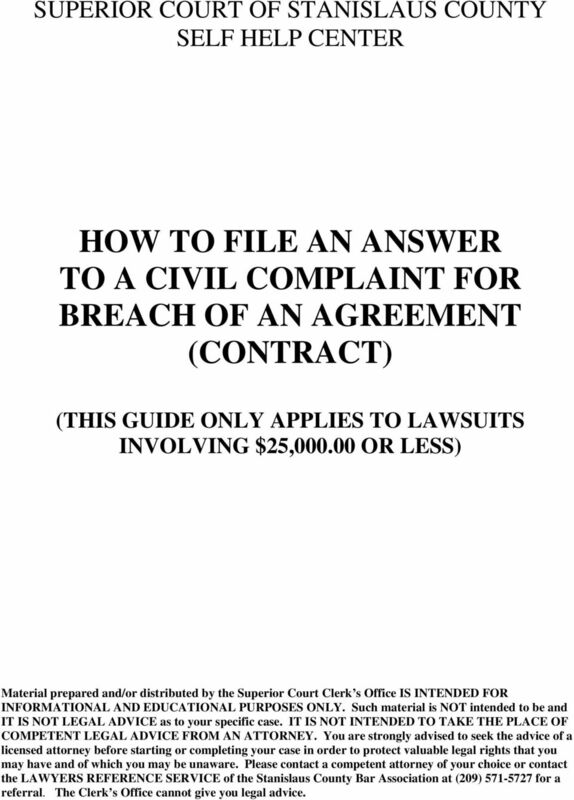 Download "HOW TO FILE AN ANSWER TO A CIVIL COMPLAINT FOR BREACH OF AN AGREEMENT (CONTRACT)"
1 SUPERIOR COURT OF STANISLAUS COUNTY SELF HELP CENTER HOW TO FILE AN ANSWER TO A CIVIL COMPLAINT FOR BREACH OF AN AGREEMENT (CONTRACT) (THIS GUIDE ONLY APPLIES TO LAWSUITS INVOLVING $25, OR LESS) Material prepared and/or distributed by the Superior Court Clerk s Office IS INTENDED FOR INFORMATIONAL AND EDUCATIONAL PURPOSES ONLY. Such material is NOT intended to be and IT IS NOT LEGAL ADVICE as to your specific case. IT IS NOT INTENDED TO TAKE THE PLACE OF COMPETENT LEGAL ADVICE FROM AN ATTORNEY. You are strongly advised to seek the advice of a licensed attorney before starting or completing your case in order to protect valuable legal rights that you may have and of which you may be unaware. Please contact a competent attorney of your choice or contact the LAWYERS REFERENCE SERVICE of the Stanislaus County Bar Association at (209) for a referral. The Clerk s Office cannot give you legal advice. 3 the filing fee is $ This fee is due from each person named as a defendant who is filing an answer. If your income is below a certain level, you may qualify for a waiver of the filing fees. You can get a fee waiver application packet from the Court Clerk s office or the Self-Help Center. COMPLETING THE ANSWER FORM All forms should be completed in type or printed clearly using blue or black ink. 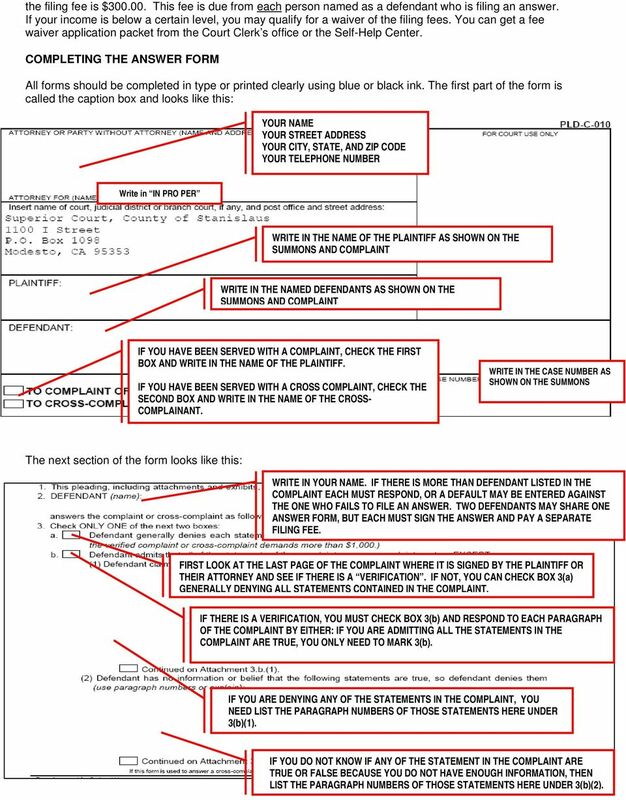 The first part of the form is called the caption box and looks like this: YOUR NAME YOUR STREET ADDRESS YOUR CITY, STATE, AND ZIP CODE YOUR TELEPHONE NUMBER Write in IN PRO PER WRITE IN THE NAME OF THE PLAINTIFF AS SHOWN ON THE SUMMONS AND COMPLAINT WRITE IN THE NAMED DEFENDANTS AS SHOWN ON THE SUMMONS AND COMPLAINT IF YOU HAVE BEEN SERVED WITH A COMPLAINT, CHECK THE FIRST BOX AND WRITE IN THE NAME OF THE PLAINTIFF. IF YOU HAVE BEEN SERVED WITH A CROSS COMPLAINT, CHECK THE SECOND BOX AND WRITE IN THE NAME OF THE CROSS- COMPLAINANT. WRITE IN THE CASE NUMBER AS SHOWN ON THE SUMMONS The next section of the form looks like this: WRITE IN YOUR NAME. 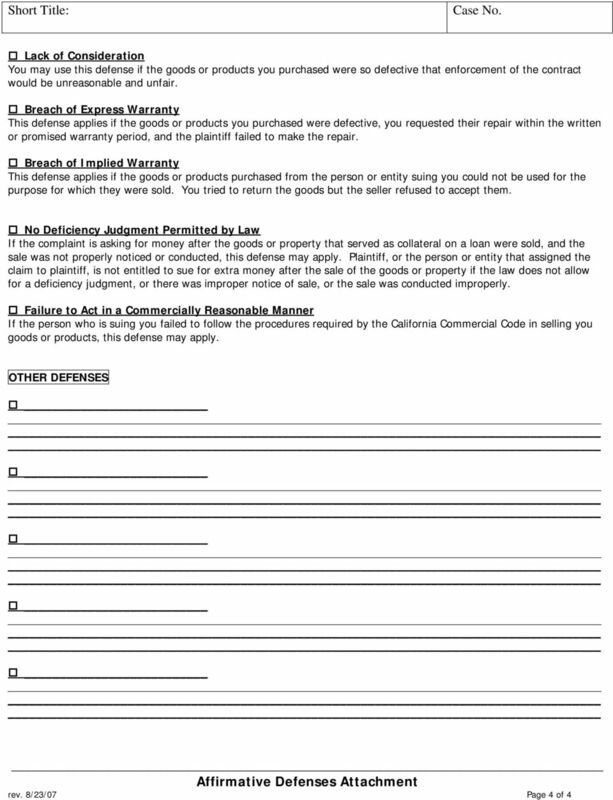 IF THERE IS MORE THAN DEFENDANT LISTED IN THE COMPLAINT EACH MUST RESPOND, OR A DEFAULT MAY BE ENTERED AGAINST THE ONE WHO FAILS TO FILE AN ANSWER. 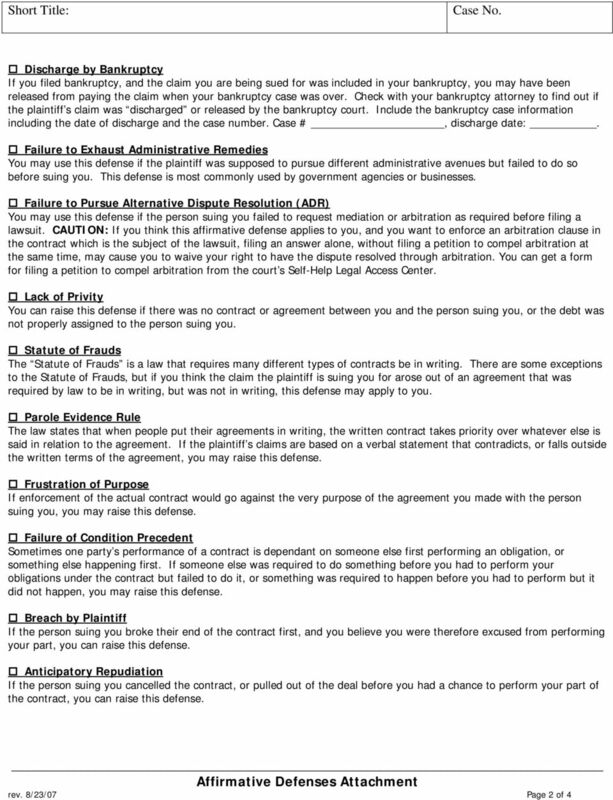 TWO DEFENDANTS MAY SHARE ONE ANSWER FORM, BUT EACH MUST SIGN THE ANSWER AND PAY A SEPARATE FILING FEE. 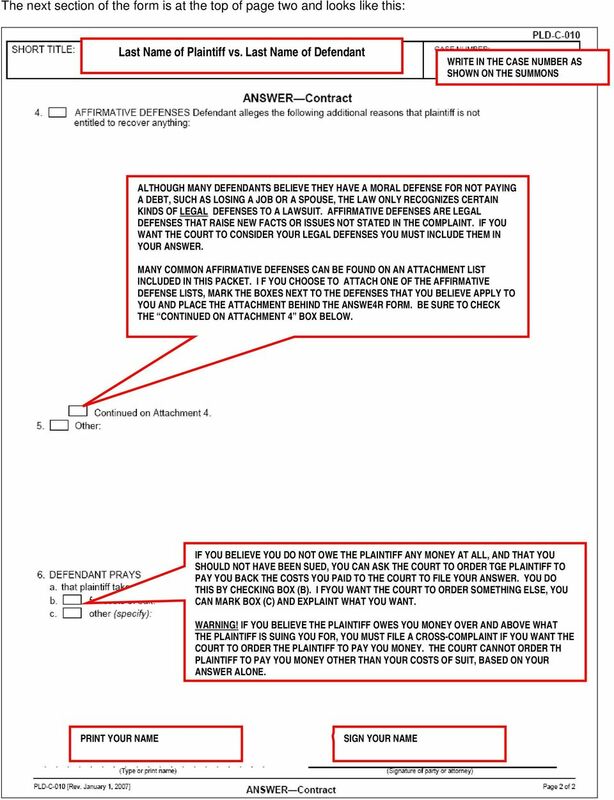 FIRST LOOK AT THE LAST PAGE OF THE COMPLAINT WHERE IT IS SIGNED BY THE PLAINTIFF OR THEIR ATTORNEY AND SEE IF THERE IS A VERIFICATION. IF NOT, YOU CAN CHECK BOX 3(a) GENERALLY DENYING ALL STATEMENTS CONTAINED IN THE COMPLAINT. IF THERE IS A VERIFICATION, YOU MUST CHECK BOX 3(b) AND RESPOND TO EACH PARAGRAPH OF THE COMPLAINT BY EITHER: IF YOU ARE ADMITTING ALL THE STATEMENTS IN THE COMPLAINT ARE TRUE, YOU ONLY NEED TO MARK 3(b). IF YOU ARE DENYING ANY OF THE STATEMENTS IN THE COMPLAINT, YOU NEED LIST THE PARAGRAPH NUMBERS OF THOSE STATEMENTS HERE UNDER 3(b)(1). IF YOU DO NOT KNOW IF ANY OF THE STATEMENT IN THE COMPLAINT ARE TRUE OR FALSE BECAUSE YOU DO NOT HAVE ENOUGH INFORMATION, THEN LIST THE PARAGRAPH NUMBERS OF THOSE STATEMENTS HERE UNDER 3(b)(2). 5 SERVING THE ANSWER Before you file your answer with the Clerk, a copy must be served on the Plaintiff or Plaintiff s attorney. It can be served by mail but must be done by a person who is not a plaintiff or defendant in this case. 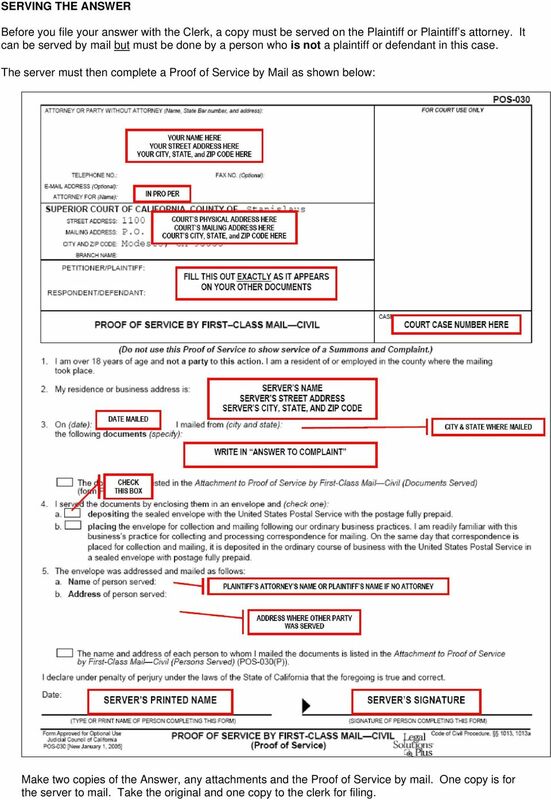 The server must then complete a Proof of Service by Mail as shown below: Make two copies of the Answer, any attachments and the Proof of Service by mail. One copy is for the server to mail. Take the original and one copy to the clerk for filing. 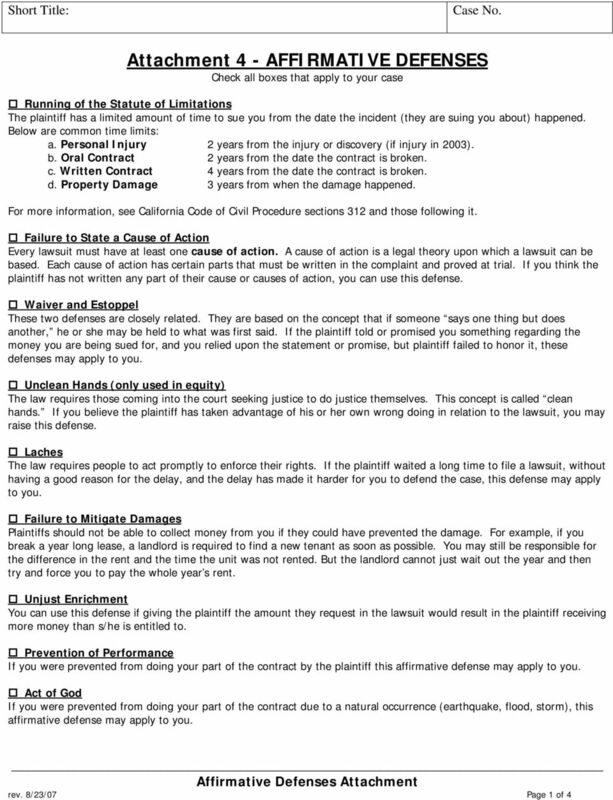 Superior Court, County of Ventura Self-Help Legal Access Center FILING A PERSONAL INJURY OR PROPERY DAMAGE LAWSUIT Plaintiff s Instructions When and Where to File 1 SC 8/99 1 When and Where to File 1. 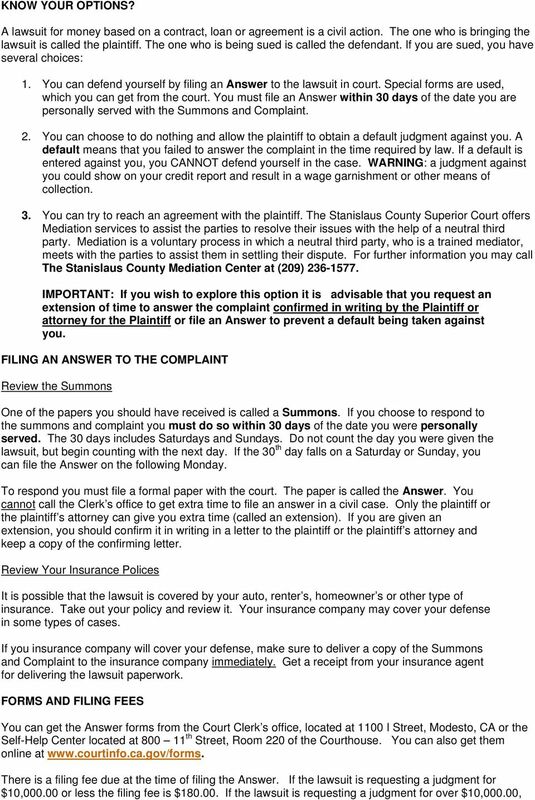 Answer to Debt Collection Suit Instructions, Example, Sample Form You will need the complaint the plaintiff filed. We have included a example Answer from Kerry Timberland to help understand these instructions. Information for pro se litigants navigating the divorce process in King County Superior Court DIVORCE ROADMAP Purpose To help people going through a divorce better understand and navigate the legal system. Representing Yourself in Foreclosure: A Guide for Connecticut Homeowners Eighth Edition, written and edited by the staff of the Connecticut Fair Housing Center who are solely responsible for its content. A WALK THROUGH YUKON S SMALL CLAIMS COURT Booklet#1: What is Small Claims Court? 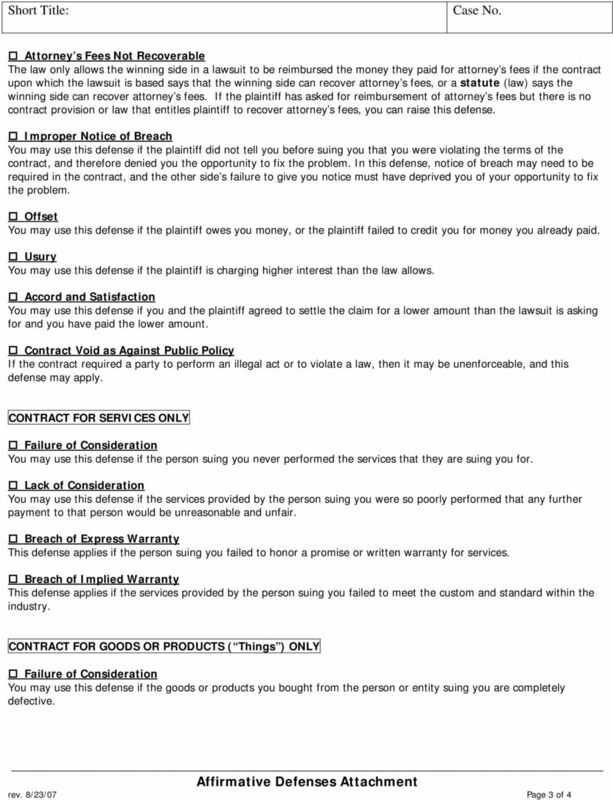 PRODUCED BY: YUKON DEPARTMENT OF JUSTICE What is Small Claims Court? What kind of claim may I file in a Small Claims Court?